Troy Hughes had a big choice to make coming out of high school, according to The Mount Vernon Register-News. Did Hughes want to turn pro in baseball and accept an offer from the Braves? Or did he want to go to college to play football? "It took a long time to sign," Hughes told The Register-News years later. "I really wanted to pursue my football career. (But) it's every kid's dream to play professional baseball." He chose baseball and he went on to play it for a total of nine seasons. He made it as high as AAA, but he never made the majors. Hughes' career began in 1989, taken by the Braves in the eighth round of the draft out of Mount Vernon High School in Illinois. Hughes started with the Braves in the rookie Gulf Coast League. The outfielder got into 36 games and hit .218. He then moved to rookie Pulaski in 1990, getting 46 games there and hitting .268. 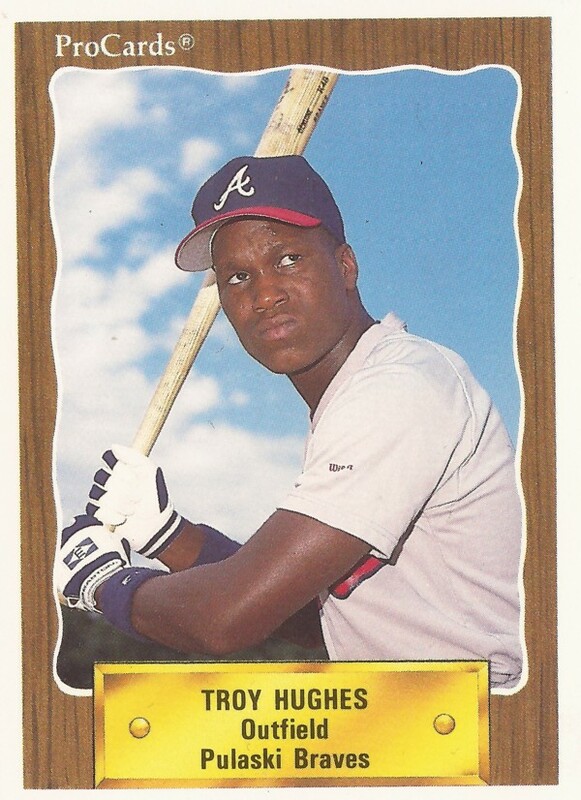 He played 1991 at single-A Macon, hitting .300 and stealing 23 bases. He also made a brief foray into politics, filing papers to run for the Illinois Legislature, according to The Associated Press. His baseball career, though, continued unbroken. He played 1992 at high-A Durham, then 1993 at AA Greenville. He hit an extra-inning, two-run home run in an August 1993 game to help Greenville to a win. Hughes made AAA in 1994, paying 81 games at Richmond. He hit .215. That spring, he hit a home run in a game for the Braves. He also made the 40-man roster. It was his only season at AAA. Hughes moved to the Yankees system mid-1995 in a trade that sent Luis Polonia to the Braves. He moved to the Cubs and AA Orlando for 1996. He helped Orlando to a June 1996 win with three hits, one a two-run home run. ''It was a curveball up in my eyes, so I got a good rip at it,'' Hughes told The Orlando Sentinel of that home run. "I came up looking fastball, but there it was, right in front of me." Hughes played one more season after that, getting time with AA Huntsville in the Athletics organization and with independent Fargo-Morehead, ending his career.